The indictments against the seven defendants including former Defence Secretary Gotabaya Rajapaksa pertaining to the D.A. 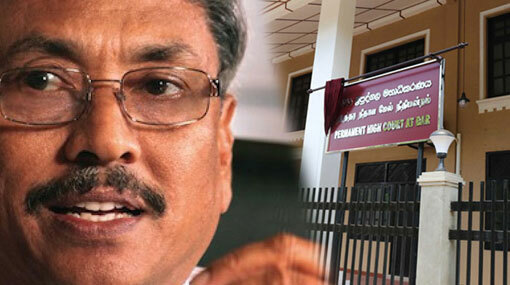 Rajapaksa Museum case have been read out at the Permanent High Court Trial-at-Bar today (22). The case was taken up before the Special High Court three-judge bench comprising Judges Sampath Abeykoon, Sampath Wijeratne, and Champa Janaki Rajaratne this morning. After the charges were read out, the Defence Attorney President’s Counsel Romesh de Silva presented a preliminary objection before the court. He stated that the Special High Court does not have the authority to hear this case. In accordance with the Judicature (Amendment) Act, the Special High Court is only authorized to hear cases pertaining to serious economic and financial crimes, and as this case does not fall into the aforementioned category, the Special High Court does not have the authority to hear the D.A. Rajapaksa Museum case, the defence attorney further stated. The Attorney General had filed the case against the former Defence Secretary and six others over the alleged misappropriation of state funds amounting to Rs 49 million during the construction of the D.A. Rajapaksa Museum and Memorial in Medamulana.